Notes: A lovely set of three die-stamped covers with appropriate postmarks to the stamps. In pristine condition. 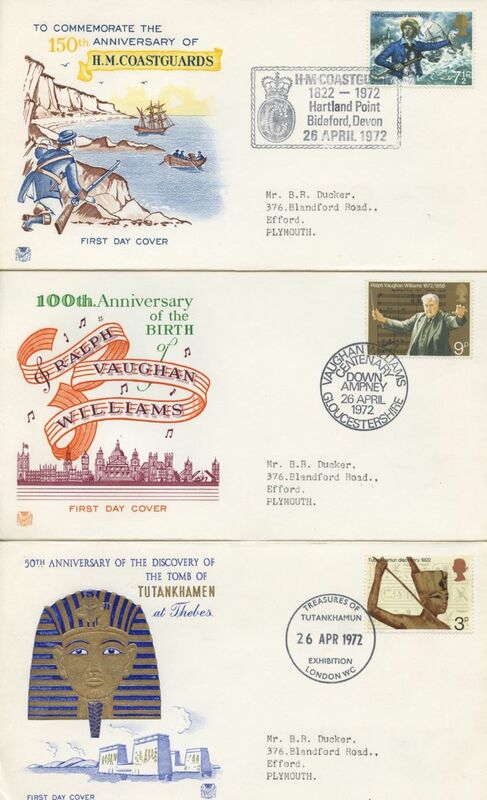 The above Royal Mail General Anniversaries 1972 stamps were issued on 26 April 1972 by Royal Mail and feature the following stamp designs: 3p Tutankhamun; 7 1/2p HM Coastguard; 9p Ralph Vaughan Williams. The Set of Three Appropriate Postmarks first day cover with the Various Special Handstamp postmark has been produced by Stuart and features these stamps which can make a very collectible and lovely gift.